Masters of Duck and Leath | RPG Review Cooperative, Inc. Plot Summary: A group of Gloranthan Ducks are hunting an ogre in the Upland Marsh. They find themselves transported to the Cumbrian Leath, where they encounter a young woman who has been struck unconscious. Helping her, she talks about a man-eating monster that is rumoured to live in the area. The talking ducks are taken to the family's homestead where they are (eventually) warmly welcomed. The family explains that a wicked knight, Sir Daffyd, with his men-at-arms and squires have been oppressing the local people and trapping them within their dungeons. As the Ducks investigate the keep, it eventually becomes clear that the ogre is not the knight, but rather the family they stayed with. Whilst confronting accusations of being demons whilst at the same time needing to excuse themselves and convince the knight of the the real location of the ogre. If they manage all this the knight will organise a sortie with the ducks against the ogre's family. In the ruins of the ogre household a talisman that allows for transportation between mythic Earth and mythic Glorantha is discovered. Masters of Duck and Leath is run to introduce people to HeroQuest, to Glorantha, and to Arthurian Britian using one of the species of Glorantha, the sapient ducks. The title is a pun from "Masters of Luck and Death" the name of a the ritual in the Glorantha, which Pharaoh Belintar performs and uses for getting new physical bodies. This ritual occurs as a tournament. On a specific day, participants wake up in a magical realm, the victor of the tournament sacrifice his body to Pharaoh and becomes liberated as an angelic being. Leath was one of the wards of the ancient county of Cumberland in north west England, roughly corresponding to contemporary Eden District. This scenario was first run at Unicon in Melbourne, Australia on Friday October 4, 2013, and on Saturday October 5, and on Sunday the 6th at the Church of Gaming. This game can be run with other characters and strengths with appropriate modifications due to the flexibility of the HeroQuest system. HeroQuest is a narrativist role-playing game, arguably the original completely narrativist game. It has its roots in Greg Stafford's fantasy world of Glorantha, but is designed as a generic system. The game's mechanics have a quick resolution method by comparison the results of two twenty sided dice, each tied to a character ability chosen by players and/or narrator. After the die roll, the participants work together to interpret the outcome in story terms. One die is rolled for the character's ability, the other for the resistance, either an ability of a another character or a resistance score of an impersonal obstacle or a force of nature. Results rank from Fumble, through Failure and Success to Critical. A Success is scored if the die roll does not exceed the ability score, with a 1 indicating a Critical success. If the die roll exceeds the ability score, the result is a Failure, while a 20 indicates a Fumble (Critical Failure). Once an ability surpasses 20, it gains a level of mastery, noted by a rune (W) and then drops down to 1. So instead of 21, the character would have a 1W. This cycle repeats, so after 20W you get 1W2, signifying two masteries. The system allows for easy scaling. In a contest, masteries cancel each other out. Hero Points are awarded at the end of successful adventures. Hero Points can be used to improve ability levels, or can be held in reserve and used to bump contest results, as with Masteries. Masteries are applied automatically, Hero points are a decision of the player. Glorantha is a fantasy world created by Greg Stafford which he "discovered" in 1966. It was first introduced in the board game White Bear and Red Moon (1975) by Chaosium, and thereafter in a number of other board, roleplaying, and computer games. These include RuneQuest (1st ed. 1978), Hero Wars (1st ed. 2000) and HeroQuest (1st ed. 2003, 2nd ed. 2009), as well as several works of fiction and the computer strategy game King of Dragon Pass. In Glorantha, magic operates from the everyday level of prayers and charms to the creation and maintenance of the world. Heroes make their way in the world, and may also venture into metaphysical realms to gain knowledge and power, at the great risk. The world is flat, with a dome-like sky, and it has been shaped in large and small ways by the mythic actions of the gods. Humans are the dominant species, but other sentient beings abound. Some, such as the mystic dragonewts, are unique to Glorantha. Nonhuman creatures typical in fantasy are present albiet with significant differences, such as elves (walking sapinet trees) and dwarves (robotised earth). Broos are creatures of chaos, with the ability mate with any species. Ducks are large intelligent ducks with arms instead of wings. They lack the ability to fly and number less than 10,000, mainly in an area called the Upland Marsh in Sartar, an area they share with undead. They are believed to the the result of a failed magical experiment. Sartar has recently been overtaken and colonised by the Lunar Empire. The ducks supported the rebellion of the local storm-worshipping Sartarites which the ducks also follow, especially the Humakt Death-God (Hueymakt Death-Drake), or Urox (The Stormbill). After this the Lunar General Fazzur Wideread, called for a pogrom against Ducks. The Ducks fled from their only city, Duckpoint, deeper into the swamp especially to a fortified location called Lookout Isle. Pendragon is a role-playing game in which players take the role of knights performing chivalric deeds in the tradition of Arthurian legend. In 1991, Pendragon (3rd edition) won the Origins Award for Best Roleplaying Rules of 1990. Actual rules for magic was not introduced until the 4th edition. There is a notable lineage in the game system and personality emphasis in Pendragon through to HeroQuest. The default Pendragon setting is a combination of actual fifth- and sixth-century British history, high medieval technologies, fashions, and social norms (10th to 15th centuries), as according to Arthurian legend. The political forces are roughly those actually present in post-Roman Britain. Technology and many aspects of culture, however, progress in an accelerated fashion, such that King Arthur's Britain is as feudal with the features of the Arthurian romances projected backwards. A Pendragon character has "Statistics" (Size, Dexterity, Strength, Constitution, and Appearance) and derived values, Skills, Personality Traits, and Passions. The latter two require some explanation, as they are atypical. The Personality Traits are thirteen opposed pairs that represent the character's personality (e.g.., Chaste / Lustful, Energetic / Lazy, Forgiving / Vengeful, Generous / Selfish, etc). Higher values in certain Personality Traits will grant bonuses either according to Chivalry, or Religion. Passions are non-paired traits (e.g., Loyalty to Lord, Love of Family etc). Passions may be invoked to provide a bonus on related actions. All tests on statistics, traits, skills, and passions are conducted with a d20 roll, which may be opposed (e.g., in combat). A Pendragon character typically has a number of squires which assist them on their quest, and usually engage in a number of non-adventuring duties (such as management of the manor) during the Winter Phase. Pendragon campaigns move through the years quite quickly and it is not at all unusual for a game to cover two or three generations of characters. The Arthurian legend is on of the three classic "matters" as described by Jean Bodel, the other being the mythological themes taken from classical antiquity, the "Matter of Rome", the tales of the paladins of Charlemagne and their wars with the Moors and Saracens, which constituted the "Matter of France". Arthur's story is the chief subject of the "Matter of Britain". The Arthurian literary cycle has two major interlocking stories. One concerns Camelot, usually envisioned as a doomed utopia of chivalric and Christian virtue, undone by the fatal flaws of the characters. The other concerns the quests of the various knights to achieve the Holy Grail. In addition the relationships between the characters established notions of courtly love, romance, and seduction. At least twenty major authors (a number anonymous) contributed to the development of the Arthurian legend, mostly in the 12th and 13th century. This includes literary figures such as Chrétien de Troyes, Geoffrey Chaucer, Geoffrey of Monmouth, and Thomas Malory. A number of modern authors have also taken the legend in terms of personal development, heroism, and reinterpretation (e.g., T. H. White, Alfred Tennyson, Marion Zimmer Bradley). Anaheim is a village of some 200 Durulz between the semi-abandoned city of Duckpoint and the refugee colony at Lookout Isle in Upland Marsh, noted as a good source of giant snails (now herded), and tasty wild reeds which have been converted to farmlands. Built on a peat-hillock it is well-protected by a strong and high wooden and stone palisade and watch towers. Anaheim is an new village but it has been used as a wayfarers post for some time prior. It has previously considered to be a place of retreat due to the chaotic dangers of the Upland Marsh. One of those chaotic dangers has been ogres, chaotic beasts in the form of humans which eat other sapient species, who are notoriously hard to discover and detect. As in other cases their presence is discovered by the evidence - in this case the gnawed remains of some young ducks who had travelled too far from the village. Hue and cry has been raised on the night as the chieften's son, Peeking Waddle, has been abducted. Apparently the young duck had been pretending to be adventuring with some friends after curfew and outside the palisade when he was captured by a large strong human. With great speed, a small team of the best ducks has been assembled to travel into the swamp and find this fiendish ogre before it is too late! Six standard ducks are provided, albeit of different professions and base abilities. Each player should add twenty ability levels (maximum of 10 in any one ability) and three flaws at 13 for their character. 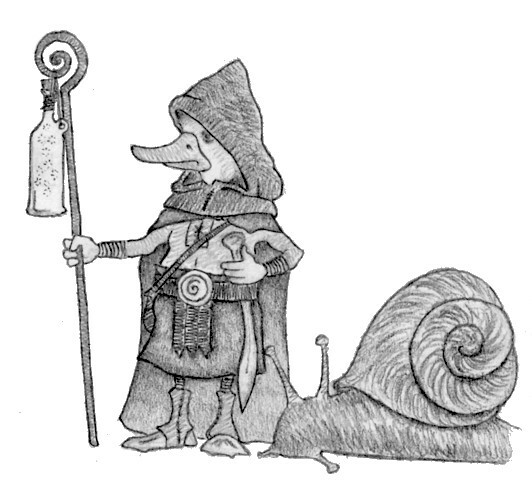 Mandrake Mallard, Bookish snailherd, worships Ernalda. Roderick Valencia, Warrior Death Duck of Humakt. Each character has 2 Hero Points which can be used during the adventure. The first scene involves the intrepid ducks searching in the swamp, in the dark, for the ogre and the chieftan's son. There are three stages to this task, finding the trail, finding Peeking's shortsword and other clues, and stepping beyond. Finding the trail should begin with a standard resolution of 14, but with a -5 to abilites because of the Darkness. Each duck is allowed an attempt, and it can almost be assumed that one will find the trail. Failure will just lead to the characters having to search longer and at a lower requirement, as per the pass/fail cycle. Success will lead the ducks deeper into the swamp, where the occasional marshy ground gives way to entirely shallow water with tall reeds. Continuing the search requires another search check, but now with a resolution number of 17, plus the modifier. Clever ducks will make use of their swim ability. Success on this second station will lead the characters to discover a clutch of feathers, and Peeking's shortsword and belt. Characters who investigate the feathers will, after a successful check, realise that they are left-arm feathers and thath the belt has been unclipped rather than torn off, both suggesting that their removal was quite deliberate (Peeking is foolhardy, not entirely stupid). Failure on the second station will lead the characters to be beset by a group of human zombies, equal in number to the player characters. Each zombie has an Sword or Spear ability of 13 (the main ability) and is augmented by their single-minded personality Eat Brains 13 (+3), plus Rotted Armour and Dodgy Equipment 6 (-1), and Watery Terrain 13 (-3). After defeating the zombies they may search again with a lower target number. As the characters travel into the weeds the swamp becomes deeper and the the misty coverage becomes stronger. Eventually they will encounter another group of zombies (as above) but who suffer a -5 terrain modifier, but these will fight on as an extended simple contest. Once they defeat the zombies and continue on their journey the player character ducks will find that the mist is gradually lifting and light is streaming in - this is not possible because it ought to be the early hours of the morning. As the reeds part, the ducks find themselves in a most peculiar setting. Gone is the swamplands of Upland Marsh and instead they are on a river bank in a forest with a light sunshine and the sound of birds. As the player characters debate about their new surroundings environs (perhaps they have been transported to Apple Lane? ), they will find hidden at the base of a tree and under some foliage an dishevelled and unconscious young woman, who has suffered a blow on the back of the head. A successful visual perception check will indicate that she wears a small silver cross (clearly a Humakti initiate!) on a necklace. Applying healing skills (mock contest) will eventually bring the young woman around, who will be absolutely terrified by the duck-like monsters and will do her best to try to escape, but will stumble and fall due to her wounds etc. If and when it becomes obvious she will express surprise that she can talk to the ducks, who apparently speak Brittonic to her - the ducks of course are hearing Tradetalk. She will introduce herself as Lunete, daughter of Owain. She's a simple peasant girl, who is not too far from home. She had completed her morning chores and had taken a walk along the river where she likes to watch rabbits, where she was set upon by a man - she suspects a fellow of the dastardly Sir Daffyd, if not the knight himself. She suspects that the ducks must be some sort of faery creature brought to the land by the magic of King Arthur's rule. Meeting with Owain, father of Lunete. A big chopping man wood who initially reacts to the ducks as some sort of monster who have captured his daughter. Only when Lunete interposes herself between them and explains how the ducks are actually her rescuers. Owain is surprised, but not doubtful towards his daughter's word. Once satisfied the the ducks are good people, he will become friendly, even garrulous, with a big toothy smile. The homestead is a single building of wattle and daub with a thatched roof. Some goats wandering about, some pigs in a pen. An old goat's skull has been charmingly nailed to one wall. Inside is a single room with including sty for the pigs, goats and chickens at the far end. There is a big bed and a plank of several pieces of wood on rocks masquerading as a table - probably an old door. A stew brews on the hearth, consisting pretty much of anything that's available and there is a barrell of an alcohol made up of vegetable scraps that weren't good enough to give to the pigs. Over dinner Owain will explain how this region, once prosperous has become blighted. It was ruled by King Pellehan who fell into sin, and was stabbed in the thigh by Sir Balin, the Dolorous Stroke. King Pellehan has fallen into another world and is kept alive at his castle by the Holy Grail, where he has become the Fisher King, or the Maimed King. The land has since fallen into ruin - crops have failed, milk comes from the cows sour, eggs are rotten. His own wife and son died of a disease, leaving just his beloved daughter. The region used to have a small village, but that too is deserted. The old knight of the castle has died and his son is a cruel ruler. Owain mentions (in a pretty broad hint) that many villagers, especially the young, have been taken to the castle but have never returned. Clearly, if the chieftan's son is anywhere, it will be there (in reality, he's in a dungeon and larder under the hay, beneath the sty). Presumably the ducks will want to investigate this keep, but they are Owain, clumsily, asks the ducks where they wish to sleep. Do they sleep on the river like 'regular ducks'? - he apologises for this phrase. He offers them his bed, he an his daughter will make up some straw and sleep on the floor. He will awken the ducks a couple of hours before dawn so they will be well rested before their dawn raid. The actual "real world" location of the adventure is Kirkoswald on the River Eden; inventive Narrators can make use of the regional map of that area. The Keep is described as being a short distance south along the river, overlooking the (almost) abandoned village. The journey is less than an hour, by country reckoning (actually two, if you're a duck). Arriving before dawn, the ducks will notice a boat on an abandoned jetty of the village. The village itself is a disaster. Half the buildings are completely collapsed and the handful of people who remain are quite mad, semi-starved, and impoverished. One character who does not fit their criteria is a portly and middle-aged gent, Brother Seissyl, a kind friar, is (ironically) feeding ducks by the river. If the player ducks disturb him, he will react in complete terror, screaming something about demonic ducks from hell - however the player-characters will not be able to understand him. The Keep is quite simple. On the roof is a Saxon spearman named Staniland, who has a mighty collection of such weapons. Inside the keep are two Briton men-at-arms, Ninian and Drust, who use two-handed long spears. The relevant total combat ability of all three characters is 5W, a combination of their weapon skills (16), their armour (13), strength (13) and their loyalty (13). There is also Sir Daffyd who, as timing would have it, was preparing his armour for a ride against Irish pirates on the coastline. With his plate armour and his mighty two-handed sword, his ability is a mighty 10W (weapon skill 20, armour 20, mighty weapon 15, knighty disposition 15). He also has a horse 18, riding 18, and lance 18 - he's pretty tough. On the ground floor is the main hall where the aforementioned Brother Seissyl and a grumpy Brother Morvydd work, and where everyone else sleeps. A trapdoor leads from the roof to a second level which houses a chapel which looks vaguely like a Humakti temple, although it also has a Lunar-style crucifixion. Inside the chapel is a nun, Brangaine, who has a Issaries talisman that allows her to speak the languages of Glorantha. She insists that she received it from a walking, talking tree, but everyone else at the Keep think's she's quite mad. Brangaine, will inform the ducks to return to the Glorantha requires them to travel among the reeds on a misty, cloudly night when the moon cannot be seen. It is almost by accident that one will find the portal. Almost inevitably there is an almighty battle before the player ducks encounter Sister Brangaine (the ogres do not know of her talisman) who hopefully can convince the fighting to end. There may be some seriously injured characters - Sister Brangaine has some churguiry ability. Reaching some level of parley, the Ducks and the Knight can converse through the sister's talisman. It will surprise the ducks to discover that the knight is most certainly not an ogre, and these are the first Gloranthan beings he has met. Brother Morvydd on the other hand, thinks that all fae creatures are the devil's handiwork, especially these monsters, and will test the ducks according to the Christian virtues of Pendragon (i.e.., Chaste, Forgiving, Merciful, Modest, Temperate). The ducks will have the opportunity to present one of their number to argue the case of why they have such a virtue. If they fail dismally, Morvydd will be able to convince the Knight that the Ducks are indeed the work of the devil and treat them accordingly. Otherwise, Sir Daffyd will come to the conclusion that the ducks are some sort of virtuous pagan and are therefore tolerable. If the ducks mentioned their stay with Owain and Lunete, and explain the behaviour of ogres in Glorantha, Brother Seissyl will rush to the main hall to recover an old illuminated manuscript which describes the story of the village, including an image of two humans eating people - they have a remarkable resemblance to the Owain and Lunete. A flash of realisation comes across the ducks as they remember the toothy grin on Owain, and the Chaos symbol of the goat's head nailed on the door. Sir Daffyd mentions that although many villagers have left, some have gone missing as well and on at least one occasion, their gnawed remains discovered. It would seem that they located their ogres! Sir Daffyd will rode forth against the ogres with two of his men-at-arms, probably Ninian and Drust (assuming they are not too wounded). Clever ducks will make their way to the ogres' home at double speed by using the village boat. The ogres are engaged in preparations to make their own way down to the Keep for a mopping up operation - little do they know that the ducks and the knight have joined forces, a possibility that they did not consider. Owain is a particularly tough character, with a total default combat ability of 10W2 - due to his size, strength, the mighty two-handed axe that he carries, and the charming chaotic feature he has, "skin like steel". Lunete, is not so fortunate, only having a total ability of 20, with a dagger, dexterity, and reflexes. Lunete is more resistant to mental or spiritual attacks than her father. Assuming all goes well, the ogres will be defeated and Peeking Waddle will be recovered. The ducks can then wait until the appropriate time to make their way back to Glorantha. Assuming this succeeds, the chieftan, Gawkip Pucewattle (character from Stewart Standfield's Duxplotation site) , is overjoyed at the return of his son (although privately he will be having some words with the boy) and calls for a great feast of fatted snails. He will ask the characters to explain at the feast their adventures in this strange place translated variously as "Dirt", "Ground" or "Earth" and how magic is so uncommon.